Is your child struggling to learn math? Are you finding it difficult to help your child with their homework? Many kids today ask questions like, “Why is algebra important? Do we really need to learn it?” After all, it would be easier if they could just get through class and then forget it. But the truth is that algebra is vital to learning and can help you in life. As you’ll soon see, there are many reasons to learn algebra. Keep reading to find out more about why we need algebra. Algebra is any type of math in which letters or other symbols represent numbers in a formula. A simple example of that is x + 9 = 10. In this case, it’s easy to see that x represents the number 1. As you already know, algebra gets far more complicated than this. Even so, the same idea is applied. When algebra becomes more complex, there are simply more steps used to solve the equation. Thanks to our qualified math tutors, we’ve come up with ten reasons as to why algebra is important. These reasons go far beyond the walls of the classroom as math is used more often in everyday life than most people realize. Other math classes like geometry, calculus, and trigonometry also use algebra as a base, making it an essential skill to master. For this reason, you’ll find that grades can improve across the board by improving math skills. Without algebra, we wouldn’t have an easy way to figure out the area of a shape. Algebra allows you to take any formula, plug in numbers, and solve an equation. This is also a huge part of why algebra is used in so many other subjects. For example, if you need to figure out how much paint is needed to cover a triangular-shaped wall, you need algebra to figure it out. Rather than guessing and buying way too little paint, you’ll know exactly what you need. Imagine if we didn’t have multiplication. Multiplication is a shortcut that allows you to simply figure out 5 x 10. If you couldn’t multiply, you’d have to add all those numbers together, or count out a grid with 50 points on it. In the same way, algebra simplifies problems so that they’re more easily solved. As we mentioned before, this is usually done with formulas. As you can already imagine, being able to solve problems with a simple algebraic formula is far faster than other methods. This not only allows homework to go faster but everyday situations. Let’s go back to the example of a triangular-shaped wall. If you know the formula, you know all you have to do is multiply the height by the length of the base and then divide by two. Algebra teaches you to follow a logical path to solve a problem. This, in turn, allows you to have a better understanding of how numbers function and work together in an equation. By having a better understanding of numbers, you’ll be better able to do any type of math. Math has been around since humans could count and started bartering. Since then, it’s evolved right alongside us and is an intricate part of our history and culture. Without math, humans might not be at the top of the food chain. We certainly wouldn’t have come as far as we have. So, by learning algebra, you can gain a better appreciation for our human history. Numerous other career paths will require you to take algebra and other advanced math classes in college to get your degree. For that reason alone, it’s vital to understand algebra at an early age. Speaking of careers, if you want to do anything to improve technology, you need algebra. This and other similar types of maths will give you the base necessary to help make technological advances. For example, it was the use of maths that allowed us to put astronauts on the moon. Without it, the astronauts wouldn’t have been able to calculate the angle at which to leave the earth’s atmosphere. Today, algebra is used in nearly every aspect of technology, which includes how smartphones and computers operate. This is a great example of how algebra can help you in your everyday life. By applying algebra to your budget and spending habits, you can make wiser decisions with your spending. By going through your bills and exploring other options, you can find out which company is actually giving you the best deal. You can use this on everything from insurance to your cell phone bill to save money. The final reason why learning algebra is important is that it challenges you. It will teach you how to face struggles and to overcome them. When you overcome a challenge, it helps build your confidence so you’re ready to face the next one. There are many challenges in life you’ll face that are more difficult than algebra, but it’s a good place to start. Now you know ten reasons that answer the question of why is algebra important. As you can see, there are many ways it can help your child throughout the rest of his or her life. Having a tutor is a great way to teach a child algebra. They get one-on-one assistance from someone that can work with them to overcome their struggles. 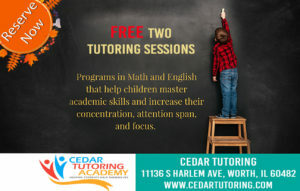 Contact us today to find out more about our tutors in Worth, Illinois that can give your child the algebra skills they need to succeed in the classroom and in life.